In a large pot, saute the spring onions and garlic. Add the lentils, green chilli pepper, salt, and water and cook until the lentils are soft. Let the mixture cool a bit and then mash using a fork, potato masher or kitchen machine. 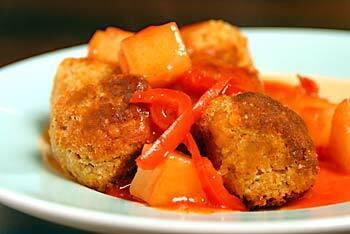 Add the pineapple juice and the bread crumbs and mix all well to form a sticky mass. 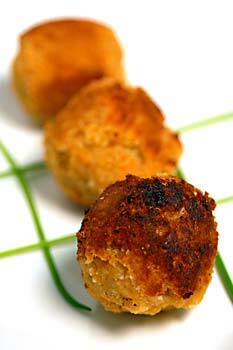 Using a tablespoon select enough of the mass to form a nice size ball and fry the balls in the oil. Using a bit of oil, saute the red peppers, add the water and tomato paste and mix well. In a small bowl mix the pineapple juice with the sugar vinegar and corn starch and when well mixed add to the tomato/paprika mixture in the pan. Place the pan on a low simmer. Add the pineapple chunks and stir until the mixture thickens. Add the fried lentil balls. In a pot, cook either rice or noodles. Serve the lentil ball mixture over the rice or noodles. Posted by Chris Walker on November 26, 2006 in Lentils, Main Dishes.